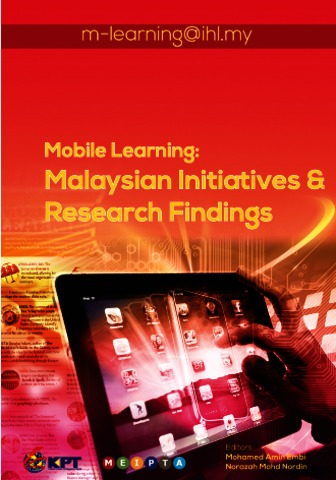 In Malaysia, the reception of Mobile Learning, based on the results of several studies, is seen as encouraging (Hashim, Wan Fatimah & Rohiza, 2010; Ismail, Gunasegaran, Koh & Idrus, 2010; Issack, Mussawir & Ramsawok, 2006; Jacob & Isaac, 2008; Naji Shukri & Abdul Razak, 2011; Norazah, Mohamed Amin, Ruhizan, Saemah & Melor, 2010; Zoraini Wati, Norziati & Ghang, 2009). These wide-ranging studies explore the elements of perceptions, readiness, and satisfaction level toward Mobile Learning; their results portend promising outcomes and positive acceptance from targeted users. The studies were conducted at various Malaysian higher-education institutions (HEIs), namely, Universiti Malaysia Sarawak (UMS), the Open University of Malaysia (OUM), Universiti Sains Malaysia (USM), Universiti Kebangsaan Malaysia (UKM), Universiti Teknologi Petronas (UTP), and Universiti Utara Malaysia (UUM).